Periodontal disease is an inflammatory disease of the periodontium. It begins with the relatively benign gingivitis and becomes more established and destructive depending on the host, genetic, and environmental factors such as long-term plaque and calculus deposition. 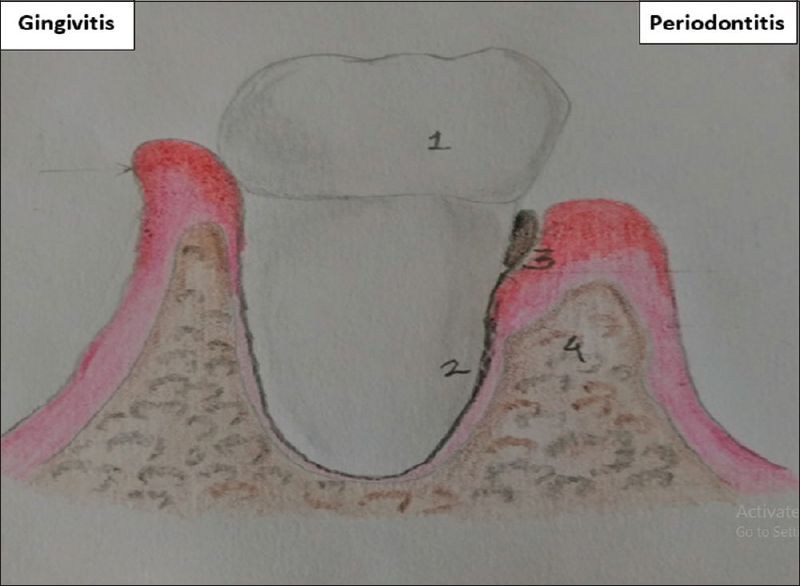 Subsequently, the connective tissue attachment to the root surface is lost causing bone resorption and formation of a periodontal pocket. We are in a new age of synthesis that demands vision, capabilities, logical reduction, and critical analysis for a constructive progress. In contrast to the conventional approaches of anti-inflammatory periodontal therapy, however, the regenerative procedures aimed at repairing lost periodontal tissues, including alveolar bone, periodontal ligament, and root cementum, remain more challenging and rapidly progressive periodontitis is attained. Periodontal disease is triggered by the host's immune response to the accumulation of oral microorganisms, resulting in the progressive destruction of the periodontium and premature loss of the teeth. It has also been linked to many systemic disorders, such as diabetes, rheumatoid arthritis, cardiovascular complications, and adverse pregnancy outcomes that significantly impact a patient's quality of life and financially impacts patients and public health-care system. Periodontal research has systematically attempted to identify clinical procedures that are predictably successful in regenerating periodontal tissues. In contrast to the conventional approaches of anti-inflammatory periodontal therapy, the regenerative procedures aim at restoring lost periodontal tissues and remain more challenging. 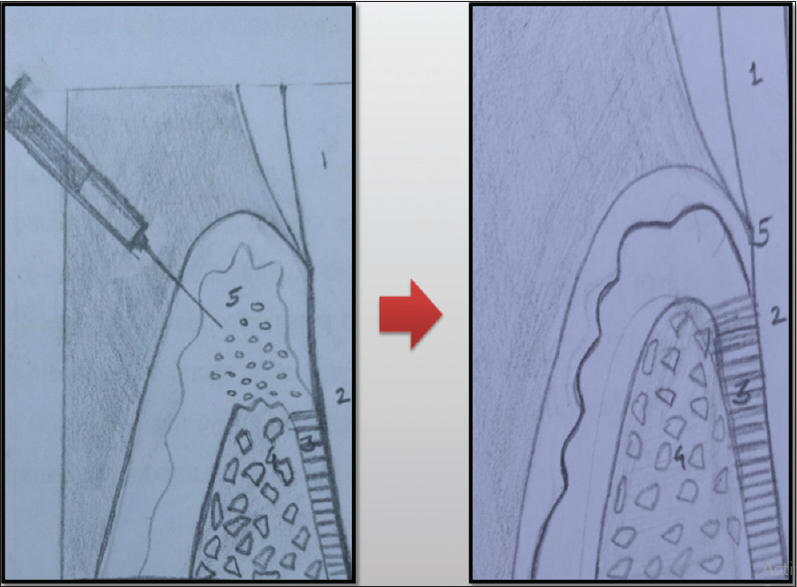 New attachment of junctional epithelium to the tooth surface and connective tissue fibers to the root surface is very critical components of true periodontal regeneration. Surgical therapy consists bone graft, guided tissue regeneration, tissue engineering, endogenous regenerative therapy, gene and cell-based therapy, and root coverage. Effective disease elimination is a key step to regeneration. Although nonsurgical therapy has been found to play no significant role in regeneration, its virtue in creating a conductive environment for regeneration cannot be disregarded. However, the surgical therapies for soft and hard tissue regeneration also have unpredictable outcomes. Effective disease elimination is a key step to regeneration. Scaling and root planing using hand instruments and sonic/ultrasonic scalers or lasers effectively treats chronic periodontitis by removing bacterial biofilm, calculus, and contaminated cementum. It induces bacteremia; antibodies thus produced, act as vaccines, limit the local infection, and further enhance periodontal regeneration. Root biomodification leads to the formation of new attachment. Even though it fails to replenish the lost periodontium, it can be used as an adjunct in regeneration. How predictable is the regeneration with bone grafts and bone substitute materials? Bone grafts/substitutes, solely, do not possess the ability to regenerate the lost connective tissue attachment. Osteointegration between the preexisting bone and newly formed bone is important. Various studies conducted on different bone fillers gave following conclusions [Table 1]. The formation of a connective tissue attachment may be absent or may not progress beyond what can be achieved with conventional therapy (i.e., open flap surgery alone). The issue is despite acceptable osteogenic potential and unlimited availability of all the biomaterials, autografts are still considered as the gold standard. However, allografts are widely used for regeneration of contained defects. Can guided tissue regeneration with barrier membranes provide true regeneration? The contribution of most grafts to regeneration was often tested together with a barrier membrane. Thus, the issue that arises is the often observed histological evidence of new connective tissue attachment. This is probably related to the barrier function and not to the supporting materials. Two meta-analyses have concluded that guided tissue regeneration (GTR) yields greater clinical attachment gain than open flap debridement (OFD) alone for intrabony and furcation defects. The predominant healing is through new connective tissue attachment to the root surface with minor contributions of new cementum and bone formation. Degree of inevitable contamination with bacteria and harmful degradation products of synthetic membranes. The host immune system determines the response against this multifactorial disease and can be modulated by various bioactive molecules [Figure 3]. Platelet-rich plasma used in various surgical fields, including maxillofacial and periodontal surgery with the expectation of enhancing bone and soft-tissue healing. Growth factors regulate cell proliferation, cell activity, chemotaxis, and cell differentiation heterogeneity in studies regarding study design, animal and periodontal defect model, types of growth factors, and carrier vehicles. Exception of GEM 21S® a β-TCP/rhPDGF-BB combination achieved successful periodontal regeneration. Bone morphogenetic proteins responsible for formation of new cementum and new bone with inserting periodontal ligament fibers support wound healing and new periodontal tissue formation. The complexity of the periodontium, which consists of four different tissues; one therapeutically applied growth factor can restore the complexity of the periodontium? Stability of the tissues that are to be formed under the influence of these factors; use of very high doses of bone morphogenetic proteins. However, further investigation is needed to facilitate the clinical translation of the polypeptide growth factors and their delivery systems. How effective is gene therapy in regeneration? Local application of growth factors encourages periodontal regeneration. Techniques to improve growth factor delivery and release become very crucial. In gene transfer, genes for regeneration-promoting growth factors using plasmid and adenovirus gene delivery methods are used [Figure 4]. Some author reported the use of adenoviral vectors encoding for growth factors such as platelet-derived growth factor and bone morphogenetic protein-7 sustained transgene expression for up to 10 days and enhanced bone and cementum regeneration at treated sites beyond this period compared to the sites treated with control vectors. An important issue is to optimize the number of cells that are virally transduced to express specific genes. The overall control of the process including both initiation and stoppage of the genes to modify the tissues becomes very crucial. In addition, research is required to assess the potential risks of the immunogenicity of viral recombination, which could significantly alter the success of gene transfer therapies for periodontal regeneration. Despite the commendable progress research has made in the form of gene delivery, this method stands unapproachable, expensive with a risk of multigene disorders and potential problems to the patient, for example, toxicity, immune and inflammatory responses and gene control and targeting issues. Tissue engineering as proposed by Langer et al. comprises multiple progenitor cells, signaling molecules, and conductive extracellular matrix scaffold, along with an adequate blood supply. Scaffolds act as the extracellular matrix creating an environment suitable for cell proliferation and differentiation for a limited period. Hence, scaffolds should fulfill certain requirements such as shape, pore size, and rate of porosity to provide a viable extracellular matrix to the cells. Signaling molecules also referred to as immune modulatory polypeptides are essential to enhance cellular activities such as cell proliferation, differentiation, migration, and apoptosis. Finally, progenitor cells or stem cells thriving within the scaffolds process the signals and carry out tissue regeneration. According to Hynes et al., the most critical component of tissue engineering is the choice of stem cell. Stem cells can be extracted from the following sources [Table 2]. Evidence indicates that the use of a graft under a coronally advanced flap results in the best short-term and long-term outcomes regarding root coverage and gain in keratinized tissue with the highest prevalence of success. A critical issue here is the choice of autogenous and allogenic soft-tissue graft material to promote regeneration. Choice can be made depending on the objectives of treatment and flap design, thickness of keratinized gingiva, width of the attached gingiva, flap tension, flap position, adaptation, and stability. Prato et al. have proposed a decision-making tree which aids in deciding the approach for recession coverage. Nevertheless, success is equally dependent on the operator skills. The outcome of any regenerative periodontal treatment is clinically assessed by parameters and reentry evaluations. Although these age-old techniques are simple, they are inappropriate to assess true attachment gain. Histological evaluation of the regenerated tissues is the only reliable method of assessing true attachment. However, it is invasive technique, so new methods to evaluate regeneration should be researched. Three-dimensional complex shapes or structures can be computer generated, constructed in a three-dimensional printer, and then used as protein or cellular carriers for custom implantable bone graft substitutes. Various interactions between the different types of periodontal cells and the effect of mechanical stress on periodontal regeneration in the periodontium need to be assessed. 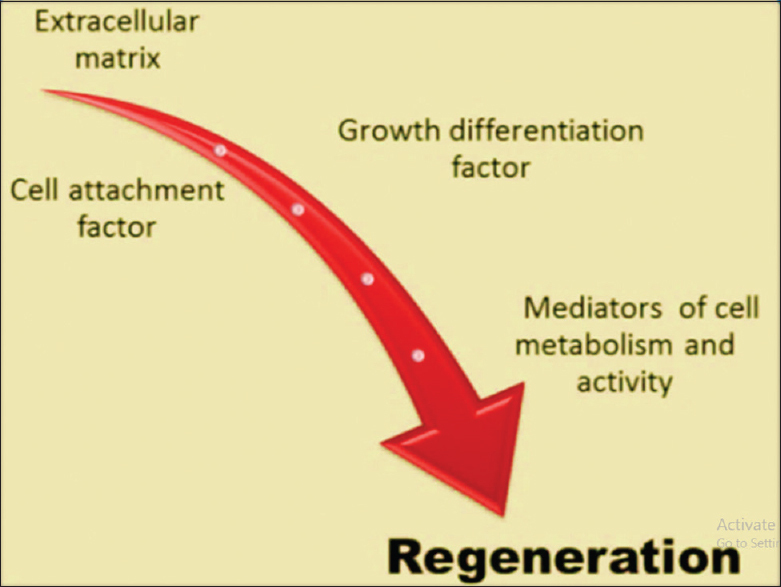 A deeper understanding of the molecular signaling (both intra and extracellular) and cellular differentiation processes involved in the regenerative processes would help in making a much wiser decision regarding true periodontal regeneration. The surgical protocols for regenerative procedures are skill demanding that positively affects the outcome of both soft and hard tissue regeneration. However, the clinical success for periodontal regeneration still remains limited in many cases due to lack of practicability for some clinicians. In addition, whether the slight clinical improvements offered by these procedures over routine OFD procedures are of cost or patient benefit with regard to improved periodontal health and retention of the teeth remains to be established. Further advancements in the field will continue to rely heavily on multidisciplinary approaches, combining engineering, dentistry, medicine, and infectious disease specialists in repairing the complex periodontal wound environment. Bartold PM. Group C. Initiator paper. Periodontal regeneration – fact or fiction? J Int Acad Periodontol 2015;17:37-49. Bartold PM, McCulloch CA, Narayanan AS, Pitaru S. Tissue engineering: A new paradigm for periodontal regeneration based on molecular and cell biology. Periodontol 2000 2000;24:253-69. Bosshardt DD, Sculean A. Does periodontal tissue regeneration really work? Periodontol 2000 2009;51:208-19. Fuentes P, Garrett S, Nilvéus R, Egelberg J. Treatment of periodontal furcation defects. Coronally positioned flap with or without citric acid root conditioning in class II defects. J Clin Periodontol 1993;20:425-30. Bogle G, Adams D, Crigger M, Klinge B, Egelberg J. New attachment after surgical treatment and acid conditioning of roots in naturally occurring periodontal disease in dogs. J Periodontal Res 1981;16:130-3. 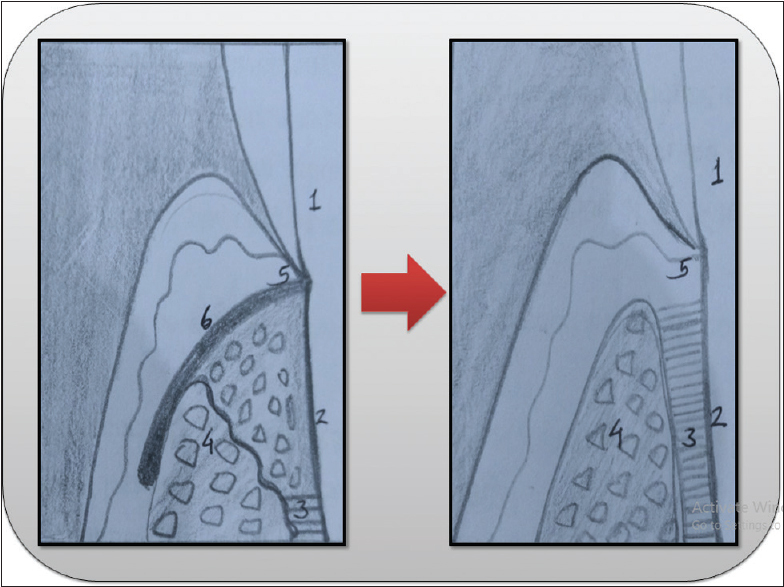 Magnusson I, Claffey N, Bogle G, Garrett S, Egelberg J. Root resorption following periodontal flap procedures in monkeys. J Periodontal Res 1985;20:79-85. Karring T, Lindhe J, Cortellini P. Regenerative periodontal therapy. In: Lindhe J, Karring T, Lang NP, editors. Clinical Periodontology and Implant Dentistry. 4th ed., Vol. 16. Oxford, UK: Blackwell Munksgaard; 2003. p. 130-13, 650-704. Jepsen K, Heinz B, Halben JH, Jepsen S. Treatment of gingival recession with titanium reinforced barrier membranes versus connective tissue grafts. J Periodontol 1998;69:383-91. Eickholz P, Pretzl B, Holle R, Kim TS. Long-term results of guided tissue regeneration therapy with non-resorbable and bioabsorbable barriers. III. Class II furcations after 10 years. J Periodontol 2006;77:88-94. Gottlow J, Nyman S, Karring T. Maintenance of new attachment gained through guided tissue regeneration. J Clin Periodontol 1992;19:315-7. Bhatnagar RS, Qian JJ, Wedrychowska A, Sadeghi M, Wu YM, Smith N, et al. Design of biomimetic habitats for tissue engineering with P-15, a synthetic peptide analogue of collagen. Tissue Eng 1999;5:53-65. Yukna RA. A clinical and histologic study of healing following the excisional new attachment procedure in rhesus monkeys. J Periodontol 1976;47:701-9. Lindskog S. Formation of intermediate cementum. I: Early mineralization of aprismatic enamel and intermediate cementum in monkey. J Craniofac Genet Dev Biol 1982;2:147-60. Kalpidis CD, Ruben MP. Treatment of intrabony periodontal defects with enamel matrix derivative: A literature review. J Periodontol 2002;73:1360-76. Esposito M, Grusovin MG, Papanikolaou N, Coulthard P, Worthington HV. Enamel matrix derivative (Emdogain) for periodontal tissue regeneration in intrabony defects. A cochrane systematic review. Eur J Oral Implantol 2009;2:247-66. Rathe F, Junker R, Chesnutt BM, Jansen JA. The effect of enamel matrix derivative (Emdogain) on bone formation: A systematic review. Tissue Eng Part B Rev 2009;15:215-24. Sculean A, Schwarz F, Chiantella GC, Donos N, Arweiler NB, Brecx M, et al. Five-year results of a prospective, randomized, controlled study evaluating treatment of intra-bony defects with a natural bone mineral and GTR. J Clin Periodontol 2007;34:72-7. Koop R, Merheb J, Quirynen M. Periodontal regeneration with enamel matrix derivative in reconstructive periodontal therapy: A systematic review. J Periodontol 2012;83:707-20. Mehta S, Watson JT. Platelet rich concentrate: Basic science and current clinical applications. J Orthop Trauma 2008;22:432-8. Trombelli L, Farina R. Clinical outcomes with bioactive agents alone or in combination with grafting or guided tissue regeneration. J Clin Periodontol 2008;35:117-35. Ripamonti U, Petit JC. Bone morphogenetic proteins, cementogenesis, myoblastic stem cells and the induction of periodontal tissue regeneration. Cytokine Growth Factor Rev 2009;20:489-99. Anusaksathien O, Webb SA, Jin QM, Giannobile WV. Platelet-derived growth factor gene delivery stimulates ex vivo gingival repair. Tissue Eng 2003;9:745-56. Imperiale MJ, Kochanek S. Adenovirus vectors: Biology, design, and production. Curr Top Microbiol Immunol 2004;273:335-57. Hynes K, Menicanin D, Gronthos S, Bartold PM. Clinical utility of stem cells for periodontal regeneration. Periodontol 2000 2012;59:203-27. Yamada S, Murakami S, Matoba R, Ozawa Y, Yokokoji T, Nakahira Y, et al. Expression profile of active genes in human periodontal ligament and isolation of PLAP-1, a novel SLRP family gene. Gene 2001;275:279-86. Bartold PM, Shi S, Gronthos S. Stem cells and periodontal regeneration. Periodontol 2000 2006;40:164-72. Agraja P, Swapna M, Chaitanya J, Prutha V. Issues in periodontal research in India. IOSR 2016;15:87-92. Prato GP, Clauser C, Cortellini P. Periodontal plastic and mucogingival surgery. Periodontol 2000 1995;9:90-105.